1 Seeing the Holy Spirit move in power in worship leading is clearly heavily dependent on your walk with God. However, there are still great ideas and tips that you can use to increase the power in worship leading you see in your church. These are not gimmicks or tricks, there are some positive and simple things you can do to see your worship leading take off in a way you have never experienced before. And surely this is what we all want, what we all desire to see in your lives, and in our churches. So in this podcast, we discuss how you can generate real power in your worship leading, by keeping close to the Lord in your quiet times and devotionals, and also by using simple techniques that can open the way for the Holy Spirit to move in your church in a new and fresh way. So settle back, grab s coffee or tea and explore simple but powerful ways you can increase the anointing of God in your worship leading... Honestly, there are definite things you can do to increase the power of your worship leading ministry. And a quick plug... If you really want to open the top end and SUPERCHARGE your worship ministry, check out our online Worship Leader Academy, where we spend a lot of time giving you teaching that can make a massive difference in the way you lead the power with which you lead and every aspect of your life and ministry for the Lord. Check it out here, and leave no stone unturned to increase the power of worship leading in your life, and in your church. FOR A SPECIAL OFFER, CLICK THIS LINK NOW! Increasing power in worship leading is something we all want, but sometimes it is a difficult thing to obtain. Seeing the Holy Spirit move in power in worship leading is clearly heavily dependent on your walk with God. However, there are still great ideas and tips that you can use to increase the power in worship leading you see in your church. These are not gimmicks or tricks, there are some positive and simple things you can do to see your worship leading take off in a way you have never experienced before. And surely this is what we all want, what we all desire to see in your lives, and in our churches. So in this podcast, we discuss how you can generate real power in your worship leading, by keeping close to the Lord in your quiet times and devotionals, and also by using simple techniques that can open the way for the Holy Spirit to move in your church in a new and fresh way. Honestly, there are definite things you can do to increase the power of your worship leading ministry. And a quick plug… If you really want to open the top end and SUPERCHARGE your worship ministry, check out our online Worship Leader Academy, where we spend a lot of time giving you teaching that can make a massive difference in the way you lead the power with which you lead and every aspect of your life and ministry for the Lord. 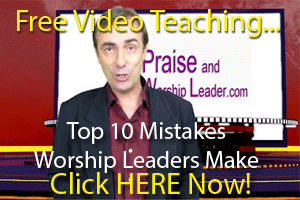 Check it out here, and leave no stone unturned to increase the power of worship leading in your life, and in your church.